List of Vegetables that Flower and Bear "Fruit"
If you arriving here searching for a list of green and leafy vegetables, just click here. For podded veggies, click here. But don't be too hasty: the veggies here are good, too, and could take a while to sample. That's part of the fun anyway. If you’re going to “do” veggies, you might as well go all the way, right? So look for recipes that use some of these—or make up your own. Avocado: an oil-rich (from 3 to 30 percent!) veggie native to Mexico and Central America. Wonderful in salads, sandwiches, and dips, particularly when paired with acidic or spicy ingredients. Armenian cucumber: a.k.a. snake cucumber, snake Melon, yard-long cucumber; tastes like a cuke and usually eaten with the skin on. My dad raised these once, and they were pretty good—if cucumbers are your thing. Aubergine: think eggplant, a gorgeous and versatile purple veggie eaten both raw and cooked (often in Italian dishes). Although I'm not crazy about it myself, after reading about its health benefits, I may have to rethink my position. Caigua: a spiky skinned vegetable (a cucumber substitute, so to speak) that also has some medicinal applications. Here's a nice description from a gardener in New Zealand. Cape gooseberry: ground Cherry, husk Tomato, golden Berry; to me these seem to be on the cusp between veggie and fruit. Very tasty, though. 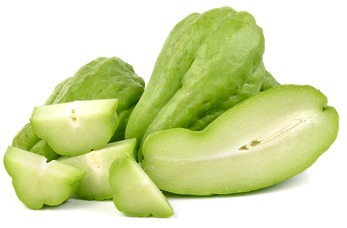 Chayote squash: a highly liquid and rather bland light green veggie that can be eaten raw or cooked, it is considered a summer squash (although often available all year round). Click here for a chayote salad recipe that uses a mustard-sour cream dressing to liven up the taste. Chili pepper: self-evident, right? You might enjoy this simple but tasty green-chili soup. 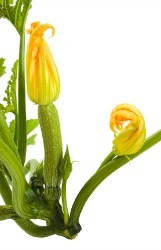 Courgette: another name for zucchini; see some ways to cook this versatile veggie. Cucumber: a fairly common veggie in many countries, it adds nutrition, fluid, and fiber to the diet. Here's an easy cucumber soup. Luffa: a squash, picked before maturity to eat as a vegetable...and is also sometimes used as a bath sponge. Because I've seen it only in its sponge "persona," I was startled to learn that it's actually edible at certain times. Malabar gourd: sometimes called Asian pumpkin; rich in protein content and cooked as a vegetable when immature. Parwal: sometimes called pointed gourd or green potato; used in soups, stews, and curries. You can find an intriguing recipe (with photos of the preparation steps here. Although I haven't tried it myself, it looks delicious. Pattypan squash: the pretty little white summer squash with scalloped edges. Although I've never actually eaten one, they sure are cute to have around. Squash: a.k.a. marrow. Did you know that? I sure didn't. 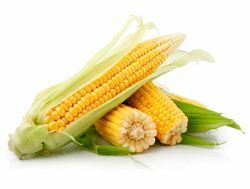 Sweet corn: we do know this one, right? Sweet pepper: see bell pepper; other varieties are pimiento, cachucha, European sweet, bull horn (thin, curved and green), cubanelle (long, tapered, yellow to red), and sweet banana pepper. Tinda: also called Indian round gourd or apple gourd or Indian Baby Pumpkin; squash-like and grown for its immature fruit, which is eaten as a vegetable. 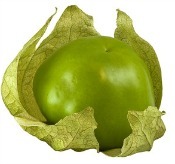 Tomatillo: a.k.a. husk tomato; relative of the common tomato and indispensable ingredient of salsa verde. Tomato: a universal favorite, the red tomato we already know, right? Green tomatoes, however, can be very tasty fried in battered slices. Chopped and lightly sautéed in butter, they can also make an interesting side dish. Winter melon: also called white gourd, ash gourd, or "fuzzy melon"; grown for its very large fruit, which when mature is eaten as a vegetable. West Indian gherkin: similar to and also related to the cucumber. Artichoke: a formidable-looking but also tasty vegetable prized particularly for its heart. Although a little fiddly to eat, many find it delicious (raising my hand here). Broccoli: see green and leafy vegetables. Cauliflower: a close cousin of broccoli, although white instead of green and somewhat milder in flavor. Delicious raw (IMHO). Squash blossoms: a truly incredible treat when stuffed with cheese (jarlsberg is great for this), rolled in a light batter, and then baked (my preference) or fried. So, that's it (so far) for this particular list of vegetables, and of course there will be some veggies missing. As always, if you have one to suggest, please let us know. Meanwhile, check out our other two veggie lists: green and leafy vegetables and our list of podded vegetables.